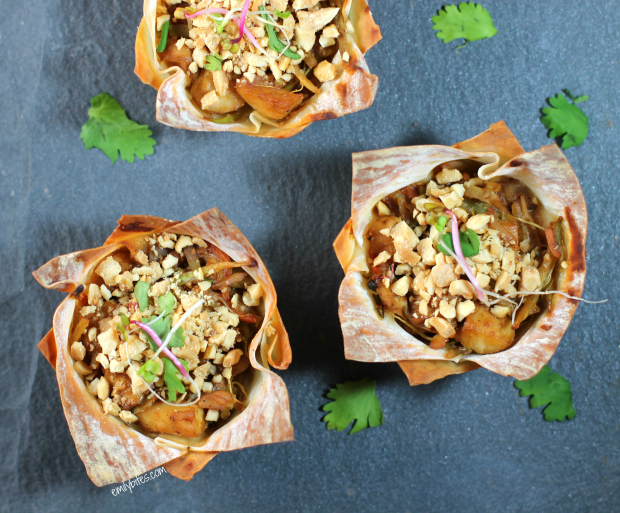 I’m always looking for new ways to use my favorite PB2 peanut sauce in a recipe, and I decided it was about time I make an Asian-themed wonton cupcake. I’ve certainly made quite a few other types! 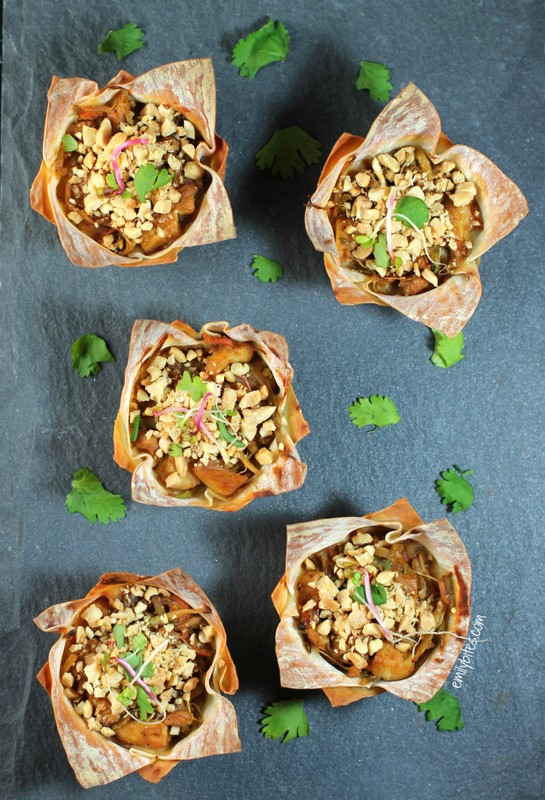 As always, these Thai Peanut Chicken Wonton Cupcakes come together quickly and easily for a tasty, portion controlled weeknight meal. Perfect to make ahead for grab-and-go lunches as well! This PB2 sauce is ultra rich and peanutty and it’s great over the hearty chicken, broccoli slaw and crispy wonton cups. The peanuts on top give it extra crunch and flavor and the cilantro and sprouts add freshness. I wasn’t originally sure about putting cheese in these since it’s not usually found with Asian flavors, but it helps the wonton layers stick together. It worked in my Thai Chicken Pizza recipe, so I gave it a try using less than usual and it worked great. Looking for more ways to use wonton wrappers? I’ve got you covered! Check out my recipes for Chicken Parmesan Wonton Cupcakes, Mini Cinnamon Apple Tarts, Taco Cupcakes, French Dip Cupcakes, Berries and Cream Cinnamon Dessert Cups, Buffalo Chicken Cupcakes, Cheeseburger Cupcakes, Lasagna Cupcakes and more! Pre-heat the oven to 375. Lightly mist 8 cups in a muffin tin with cooking spray and set aside. Pour 1 teaspoon of sesame oil into a skillet and bring over medium heat. Add the broccoli slaw and bell pepper and cook for 3-5 minutes until slaw is tender, stirring occasionally. Transfer the slaw mixture to a mixing bowl and combine with the chopped chicken and the sprouts. In a small bowl, combine the remaining ¼ teaspoon sesame oil, PB2 powder, soy sauce, water, garlic powder, black pepper, sriracha and brown sugar and stir until well mixed into a sauce. Add the sauce to the chicken and slaw and stir to coat. Push a wonton wrapper into the bottom of each of the eight sprayed cups in the muffin tin. Using about half of the chicken mixture, spoon evenly into the wonton wrappers. Sprinkle the Mozzarella cheese evenly over the top of each cup. Press another wonton wrapper on top and add the remaining chicken mixture on top. Sprinkle the crushed peanuts evenly over the tops of the cups. Bake for 18-20 minutes until golden brown. Let cool 5 minutes before removing from muffin tin. Sprinkle the torn cilantro leaves and additional sprouts if desired. Looks delicious! Thank you for your recipes! OMG! Your French dip wonton cupcakes are one of our FAVORITES and I’m drooling looking at these. I can’t wait to try them! Just curious how you heat these up. Do they get soggy in the microwave? I do usually microwave them, but you could throw them in the toaster oven if you prefer. The bottoms are soft and the tops are crispy by nature and they stay that way when reheated. I definitely wouldn’t say they get soggy though. What would be the accepted substitute for PB2 with regular peanut butter or peanut sauce? Just made these tonight and they were so very good; husband loved them too! I will make these again. Thank you so much for sharing your recipe’s. Thank you, Emily, for such a tasty recipe. I didn’t have any precooked chicken so I amped up the spiciness by cooking some chicken breasts in hot chile oil before adding the broccoli slaw. It was fantastic! Husband ate 3 and claimed the leftovers for lunch. Excellent!! I accidentally omitted the PB2 but they were still really good! Extra sriracha for dipping hit the spot. These are easy to make and taste so good. I used Tabasco in place of the sriracha. Next time I will add more broccoli slaw & peppers to up my veggie intake. The are great cold for lunch or breakfast on the go. Thanks for creating. I’m usually not a big peanut sauce fan, but we really enjoyed these. I didn’t use spouts, cilantro, or peanuts, and I added in extra slaw (2 c.) and red peppers (heaping 1/4 c.). I also didn’t have siracha so I used red pepper flakes and added 1 t. Hoisin sauce. Thank you Emily! AMAZING! Everyone, even my very picky 2 & 5 year-olds, LOVED these! I was afraid it wouldn’t have enough peanut butter flavor for me (I’m slightly addicted to all things peanut butter), but they were absolutely perfect! These are going into our regular recipe rotation. Thank you so much!